Look to promote your company brand logo with a smooth sleek finish on a highly useful corporate gift? Start booking in those clients and customise your own hard-backed meeting books to hand out as perfect business gifts and freebies. 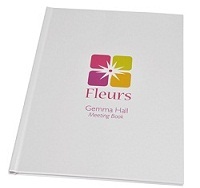 You can hand these Customised Branded Meeting Books out at conferences and trade shows to ensure brand awareness and full retention on the huge 148 x 210 Personalised print area on the front cover. Ensure your brand name won't be missed by providing clients and potential customers with a long lasting professional corporate momento - ideal for training and conferences. Containing 50 sheets of A4 double sided quality paper for individual names and event details!!! For a FREE QUOTE on our Customised Branded Meeting Books<< Click here and fill in the contact form and we'll get straight back to you.